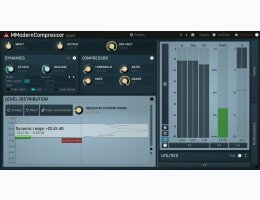 MModernCompressor is a perfect mix of great features and ease-of-use. It provides astonishing sound with the exact amount of features needed by a versatile compressor. MModernCompressor doesn't only display the typical parameters, gain reduction, output peak and loudness values, but also shows a level distribution graph, from which the plugin can actually setup compressor parameters automatically! You need your compressor to be able to process various types of audio. Our versatile envelope follower features RMS length, look-ahead, fully featured 6-band equalizer filtering, psycho-acoustic prefiltering, spectral smoothing and more. If ease of use is not the aim for you or you want to get a little more creative, you will enjoy the more advanced features of MDynamicLimiter - psycho-acoustic prefiltering, custom attack and release shapes, spectral smoothing plus much more.